If you know something of the history of the Cavalier 28 not covered by the information on this page, please let us know. Add a comment below or email the webmaster. 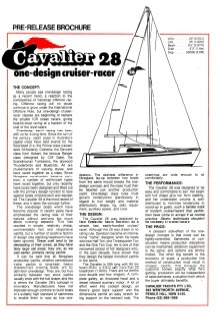 As described below by John Macfarlane, the Cavalier 28 has its origins in the Davidson 28, first designed and built in New Zealand in the mid '70s, later imported to Australia and somewhat re-designed as the Cavalier 28. Some other Cavalier models also owe their origins to the same desgin. This article was originally published in the April 2001 edition of Boating New Zealand. It appears here courtesy of John Macfarlane and Boating New Zealand. Two names are synonymous with the D28, designer Laurie Davidson and OK racing champion Dave Blundell. Both were involved with Maritime Holdings, builders of the IOR influenced Davidson 31, and after Maritime Holdings sold out to Compass Yachts in 1975, Blundell commissioned Davidson to design a similar sized boat for himself. It had to be a good performing, simple, solid, roomy, cost effective family cruiser, with no regard to the IOR rules – emphatically an anti IOR boat. Blundell built the first “boat” 10 mm undersize in pine stringers covered in wallpaper, faired it with plaster of paris, then laid up a 10mm glass hull over that to the correct size, fairing the glass as he went. Then he took the full production mould off the hull, removed and destroyed the “plug” and for his work had the first bare hull and the production mould. Blundell had the production hulls contract built by Moana Fibreglass, while he focused on marketing the bare hull concept and assembling finished boats. Hulls sold so readily that 16 were sold before the first D28 was launched. Nine D28’s were built to MOT specifications for Rainbow Yacht Charters; some of these are still in charter today. Around 1981, with 120 D28’s sold and 12 of the bigger Davidson 35 built; Export Yachts bought the rights and moulds to both boats from Blundell. However, Export yachts preferred to focus attention onto the D35 - only another 18 or so D28s were built in New Zealand. The original D28 moulds were destroyed by fire; new moulds were built but hardly used before Export Yachts liquidated in 1987. For many years the D28 was built in Australia as the Cavalier 28, initially an exact copy, however later the length was increased to 30’ and the rudder moved inboard. No one is quite sure how many were produced in Australia – certainly over 100. Production ceased when another fire destroyed the Australian moulds, but Wayne Richardson of Sydney has obtained the ex-Export Yachts D28 moulds from the New Zealand D28 Association. Amateur builders finished off nearly all D28’s, there were only a few factory built boats. Amateurs received a solid GRP hull, a GRP cockpit and main hatch, a comprehensive set of drawings, specifications, instructions and photos, all able to be loaded on a trailer behind the family car and taken home to the carport or garage. The first 50 hulls were built with timber and ply decks/cabin, and then a GRP balsa cabin/deck was made available. The all GRP boats have slightly more room inside because Blundell widened the cabin mould slightly. Keels were all lead, through bolted with 7 x 15mm bolts, to solid 100 x 100mm glassed over kauri floors. Davidson has always been particular about his foils, he specified exactly the shape for the D28 keel and rudder, which is one reason it sails so well to windward despite a relatively portly hull. The interior layout was unusual for New Zealand at the time in that the galley occupied most of the starboard side with a dinette arrangement to port. This had the advantage of giving the cook plenty of space for cooking at anchor, great for a family while gulf cruising. The heads is in its own compartment forward of the mast, headroom is 1.8m throughout the whole cabin area. The conservatively sized masthead rig is keel stepped, and as designed had four headsails. Engines were typically the Bukh 10 or similar, mounted under the cockpit. The D28 performs excellently under sail; typically club handicaps place it among boats two to four fee longer. It has no vices, has easy, predicable handling and is stiff. While offshore voyaging in a D28 is not necessarily recommended, Don Jones has sailed the Tasman three times in his D28 with no difficulties. The hull has a lot of buoyancy and the ends are full. The outboard, balanced rudder is hung from pintles on the stern, steering is light and the boats are highly manoeuvrable. Blundell is emphatic there are no weaknesses in the D28 design if the design specifications have been followed with the sole exception of the odd rudder failure - which was usually traced to owners not following Davidson’s drawings. By now most affected rudders will have been strengthened. After a relatively good run, age related osmosis is now showing up and should be specifically checked for. Age related problems in rigging, mechanical and cosmetic areas are also items of concern to a potential owner; a survey by a reputable surveyor is essential, especially as the likes of a full osmosis repair or a new engine would add considerably to the purchase price. Prices for the D28 range from $28,000 to $36,000. While the all GRP version is recommended from a cosmetic viewpoint, there is nothing inherently wrong with the timber decked version provided the joints are sound, the timber and ply is free of rot and the plans were followed exactly. The New Zealand Davidson 28 Owners Association has been very active in the past but is quiet at the moment; new or aspiring D28 owners should make contact, the Association has a great pool of knowledge about the boats. This article refers solely to the original New Zealand designed and built Davidson 28. While Davidson 28 moulds were used to build the Australian Cavalier 28/29, I have no knowledge of the construction detailing of the Australian built version. I would strongly recommend potential Cavalier 28 purchasers to make contact with the Australian Cavalier 28 Organisation and commission a professional marine survey prior to purchase. As always, a cheap yacht needing expensive repairs is a poor bargain.